The Chew crew whipped up naughty and nice cocktails: Clinton’s Minter Wonderland and a mistletoe bellini. 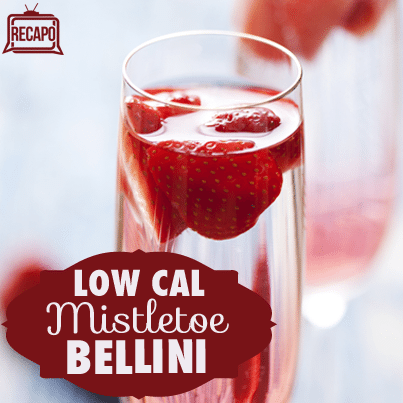 Kelly said his mistletoe bellini was the nicer of the two options because it only has 45 calories. Unfortunately, if you’re looking for holiday magic, the bellini doesn’t actually have any mistletoe in it. Carla Hall helped him make it and they pureed some fresh raspberries with a little bit of water. They strained out all the seeds and then combined the puree with raspberry liquor and champagne. When opening champagne, Kelly said you need to keep it at a 45 degree angle. He topped his mistletoe bellini with some fresh mint. Kelly’s Minter Wonderland has more than 300 calories and is for those that like to live on the naughty side. 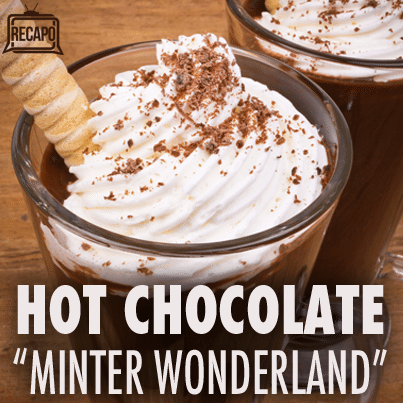 They combined brandy, rum and Creme De Menthe and topped it with hot chocolate. He whipped cream with more Creme De Menthe and then placed a dollap of it on the drink, then topped it with shaved chocolate. The Chew made two drinks fit for your holiday party: a mistletoe bellini and Clinton’s Minter Wonderland. Blend the fresh berries in a food process and strain. Add the puree, liqueur and sparkling rose to cocktail shaker with ice. Roll the ingredients three times in the shaker and then strain into a chilled champagne flute. Garnish with mint. In a heatproof mug, combine the brandy, white crème de menthe, dark rum and hot chocolate. Stir and top with the peppermint whipped cream and garnish with the shaved chocolate.